"Li'l Red Riding Hood" was a novelty hit in 1966. It made it to number 2 on the Billboard Top 100. This song was sung by Sam the Sham and the Pharaohs. 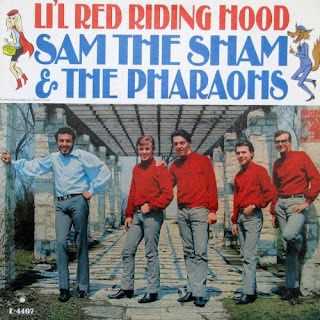 Sam the Sham was actually Domingo Samudio. He hauled his music equipment in a 1950's vintage hearse! Here is a fun performance video from 1966, interspersed with an old Betty Boop cartoon. I thought this fun, quirky song would be a good music break today. Do you remember this tune? What is your favorite novelty song? Had never heard of this song before. Thanks for sharing! I love this song!!! My high school sweetheart listened to "oldies" and this was one of my faves! It was in a thriller too but I can't remember the name. Thanks for your visits and comments! I enjoyed hearing from you.